Yesterday, I happened to see a funny picture about a ‘crab sunbathing’ and thought it might be fun to pass along the picture and write about the Swarovski crab figurines produced by our favorite crystal brand. The earliest Swarovski Crab was produced 1984 through 1986 in the Trimlite product line. The Trimlite Crab is about 1.75” long. It was known by the product identifiers 50/2G / 52502. The Swarovski Trimlite Crab originally retailed for $25 when it was available in the late 1980’s. This Swarovski Crab is a clear crystal stone set in a gold-colored setting which is used for the head, legs, and pincers. It was a part of the Trimlite “Seaside Collection”. According to the most popular book on Swarovski crystal, the estimated replacement value (for insurance purposes) is approximately $150 and I was able to find the Trimlite Crab at professional broker sites for $155 to $180 each. The next Swarovski Crab was introduced in 1996 and did not retire until 10 years later in 2006. It was the Swarovski Mini Crab. Like the Trimlite Crab, the Swarovski Mini Crab was also about 1.75” long. This newer crab, which was in the Silver Crystal product line, was designed by Michael Stamey and is identified using product numbers 7624 000 004 / 206 481. It originally retailed for $75, and in 2012 can generally be purchased in the $45 – $75 price range. The most recent Swarovski Crab was produced 2005 through 2010. Designed by Heinz Tabertshofer, the Swarovski Hermit Crab was the largest of all the Swarovski crabs sold and marketed by the crystal giant. It measured in at 2” in length. Just like the Swarovski Mini Crab, the Hermit Crab was considered Silver Crystal too. 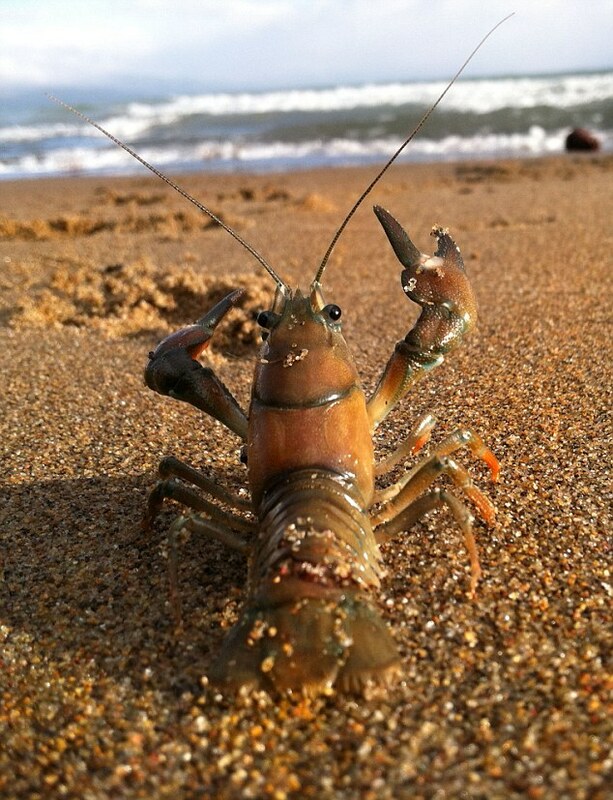 While the hermit crab retailed for $85, present day, it normally sells in the $60 – $120 range. 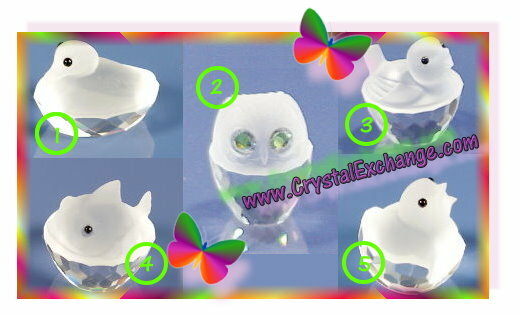 Both the Silver Crystal Swarovski Crab figurines are fairly inexpensive and easy to find. Since I’m not much of a seafood person, I’d much rather display a crystal crab than have to eat one! 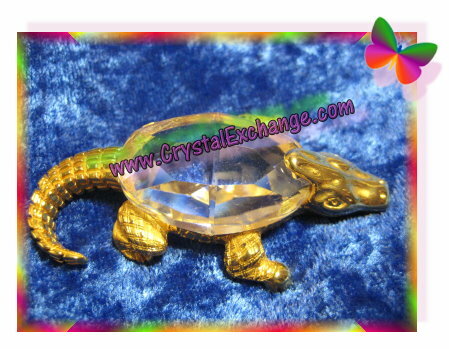 Crystal Exchange America recently sold a Swarovski Trimlite Alligator for the attractive price of $75! Swarovski collectors know that the Trimlite figurines are some of the more difficult pieces to find, so finding one at this price was a plus! Trimlite Alligator – 52504. This Swarovski Alligator was produced 1982 through 1988 and originally retailed for $18. The Trimlite Alligator is just under 2.5 long. It has a clear crystal stone for the body, with a lot of gold-colored trim, which is typical of the Trimlite product line. The body stone for the alligator is a former chandelier component. The hole for the component is highlighted in the photo. The Trimlite logo “T” is stamped into the underside of the alligator head metal and is also highlighted in the same photo. The year 1982 is stamped below the Trimlite “T”. 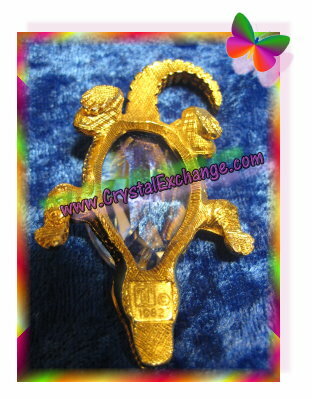 Silver Crystal Swarovski Alligator – 7661 000 005 / 221 629. This Swarovski Alligator was produced 1998 through 2004 and originally retailed for $75. The Silver Crystal Alligator is approximately 3” long. The head, body, legs, and tail are all clear crystal. This alligator figurine has the Swarovski Swan logo on it. 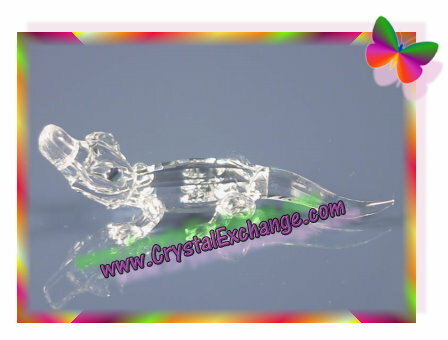 I don’t know of any ‘alligator collectors’, but if you are, Crystal Exchange America still has a couple of all-crystal (Silver Crystal product line) alligators still available in their online store. Swarovski Alligator figurines are located within the Animals category of the store. 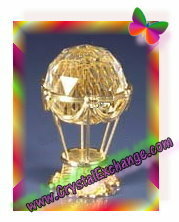 Crystal Exchange America recently sold less frequently seen figurine, the small Swarovski Acorn. 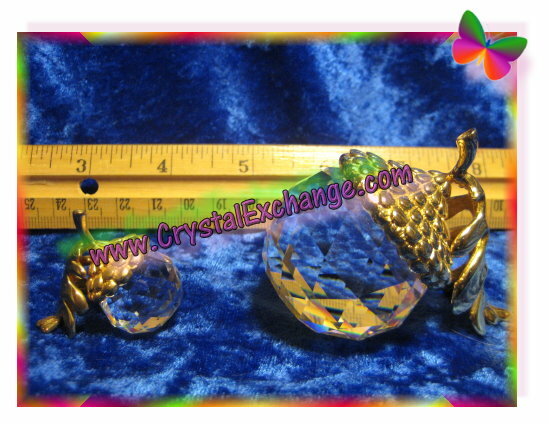 This ‘nut’ is in the Swarovski Trimlite product line in the “Pineapples and Acorns” grouping. Small Trimlite Acorn – 52620. This Small Swarovski Acorn is about 1.25 inches in length. It has a clear nut with gold-tone trim for the leaves. The original retail price of the acorn was $25 when it was available in stores in the mid and late 1980’s. Large Trimlite Acorn – 52621. This Large Swarovski Acorn is about 2.5 inches in length. It also has a clear nut with gold-tone trim for the leaves. The original retail price of the acorn was $50 when it was available in stores in the mid and late 1980’s. Both Trimlite Acorns are marked by the Trimlite T Swarovski logo in the gold leaves, but it can be difficult to find since it is somewhat hidden. The small Swarovski Acorn was purchased by a long-time collector for $50. 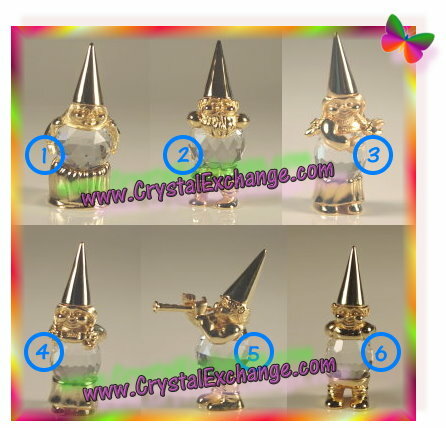 At the Crystal Exchange America website, Swarovski Acorn figurines can be found in the Vintage Swarovski category, then Trimlite & Zales sub-category when there are listings available for purchase. Over the past couple months, I’ve compiled information and written about various Swarovski Trimlite collections including the Trimlite Crystal Champions and Trimlite Gnome Family. Other Trimlite figurines exclusively featured on the Kristall Buzz include the Trimlite Hot Air Balloons, Trimlite Clowns, and Trimlite Penguins. The Trimlite Frosty Friends has a much different look than these other collections and figurines that I’ve written about. If a collector looks to see what the majority of Trimlite figurines have in common, it can be seen that many have a significant amount of gold-tone trim attached to the crystal components. The Trimlite Frosty Friends have no gold-tone trim. These Swarski figurines, “Frosty Friends” are a single crystal component. The bottom half is faceted crystal and the top half is frosted crystal. Except for the eyes, there is nothing else attached to the single crystal component. All five figurines measure 1” to 1.5” in height. Frosty Friends Duck– 9430.101 / 52601. This Trimlite Duck features a frosted duck atop a clear faceted base. Frosty Friends Sparrow – 9430.104 / 52604. This Trimlite Sparrow features a frosted bird atop a clear faceted base. Frosty Friends Fish – 9430.102 / 52602. This Trimlite Fish features a frosted fish atop a clear faceted base. Frosty Friends Chick – 9430.103 / 52603. This Trimlite Chick features a frosted bird, almost like it is hatching from a clear faceted egg. All the Swarovski Frosty Friends were introduced in 1985 and retired in 1988. The five Frosty Friends retailed for $20 each. To purchase any of these Trimlite figurines, a collector may have to fork out $75 to $175 for a mint condition Swarovski crystal figurine. Originally, I thought that “Frosty Friends” has something to do with cool weather. However, after working on this article, looking at figurines and pictures, my conclusion is that the group got its name from the significant frosted accents on the component. I’m not certain if this particular grouping ever had a Swarovski logo or Trimlite logo on it. The popular Swarovski book, Warner’s Blue Ribbon Book on Swarovski, indicates that ‘mark not visible’. However I speculate that there was not a mark at all. Most Trimlite figurines have a “T” stamped in the metal, but these figurines have no metal. Again, this ‘unmarked figurine’ possibility is just my theory and it is not found to be a documented fact. Crystal Exchange America presently has listings for the Chick (52603), Duck (52601), and Fish (52602) if you are looking to add these unusual Swarovski Trimlite figurines to your collection. To find them, go to www.CrystalExchange.com . Then look in the “Vintage Swarovski” category, “Trimlite & Zales” subcategory. I’m guessing that by now, September, 2011 many people have either heard about Happy Feet the 2006 Warner Bros movie, or more recently, the Emperor Penguin named “Happy Feet”. The recent Happy Feet story is one of an Emperor Penguin that somehow lost his way from his usual surroundings of Antarctica, ended up on the sandy beaches of New Zealand, and then became ill eating unusual things, requiring surgery and healing. Good news…on September 6, Happy Feet was released into the frigid Southern Ocean waters with the hopes that he would eventually return home. This special penguin was equipped with a tracking device for his followers to watch his journey home. Here is the release video and more information on tracking Happy Feet’s Return to the Antarctica. This recent event made me think of the different Swarovski penguin figurines that have been produced in the Swarovski Trimlite product line. 3 Trimlite Penguin figurines with gold trim: Small Penguin (52613), Medium Penguin (52614), and Large Penguin (52615). 2 Trimlite Penguin figurines with gold and pewter accents: Swarovski Small Pewter Penguin (72113) and Swarovski Large Pewter Penguin (72112). I think that the cutest Swarski ‘Happy Feet’ are the Swarovski Trimlite Pewter Penguins. Given their rarity and value, I’ll provide a bit more information these Trimlite Penguins. The Large Pewter Penguin is 5” tall. It was produced 1982 through 1986. While it originally retailed for $125, purchasing one now will likely cost $500 or more. The Small Pewter Penguin is 3” tall. It was produced 1982 through 1986. While it originally retailed for $195, purchasing one now will likely cost $500 or more. Both these Trimlite penguin collectibles are a part of the Trimlite group “Boutiques and Paperweight”. 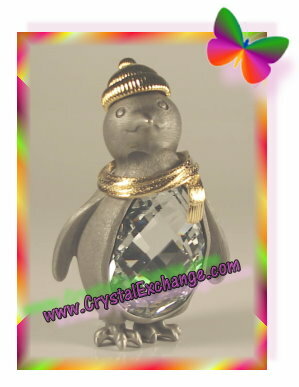 Crystal Exchange America presently has over 20 mint Swarovski crystal penguin figurines, including some of the rare ones, listed in their online store. 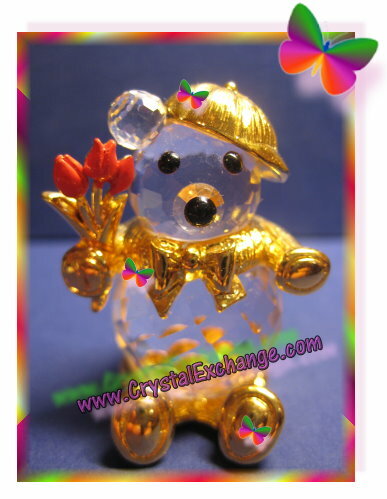 The easiest way to find them is to go to www.CrystalExchange.com and type “penguin” (without quotes) in the search box to see a list of the many penguin figurines available. Some of the older crystal figurines by Swarovski were produced in the Trimlite product line. The Swarovski Trimlite product line existed in the 1980’s. These figurines were usually on the smaller side (under 4″) and included significant gold metal accents. IF there was any type of Swarovski logo on them, it was the Trimlite “T”, and it was stamped into the metal. One of the Swarovski Trimlite groups was the “Crystal Champions”. There were six athlete (some leisure athletes!) crystal figurines in the Crystal Champions. Trimlite Baseball Player – 52729. The Baseball Player was produced from 1984 to 1988 and originally retailed for $50. Trimlite Fisherman – 52730. The Fisherman was produced from 1985 to 1988 and originally retailed for $50. Trimlite Golfer – 52727. The Golfer was produced from 1984 to 1988 and originally retailed for $50. Trimlite Basketball Player – 52725. The Basketball Player was produced from 1984 to 1988 and originally retailed for $50. Trimlite Skier – 52726. The Skier was produced from 1985 to 1988 and originally retailed for $50. Trimlite Hockey Player – 52728. The Hockey Player was produced from 1984 to 1988 and originally retailed for $50. As I mentioned in a previous Trimlite article, the production quality of crystal figurines has vastly changed in the past 3 decades. It is not unusual to see rough edges or other imperfections on the older crystal because that was likely acceptable standards at the time. Many serious crystal collectors will not accept damaged crystal figurines, but should be mindful that one considered ‘mint’ at that time will not likely as pure as figures that are produced and sold present day. And, due to the age of the Trimlite figurines, the gold metal finish has possibly dulled, tarnished, or even chipped off. Collectors should keep these things in mind when setting their own personal standards of acceptability into their own crystal collection; do not require quality standards higher than what Swarovski themselves expected in the 1980’s. Crystal Exchange America presently has 3 of the 6 Trimlite Crystal Champions figurines offered on their site at www.CrystalExchange.com, ranging in price $215 – $325. They can be found in “Vintage Swarovski” category, “Trimlite and Zales” sub-category of the store. Within the Swarovski Trimlite line, there were figurines produce in “The Gnome Family” group. According to Wikipedia, gnomes are “small humanoid creatures that live underground”. Swarovski’s artistic interpretations of gnomes are delightful little figurines have round crystal bellies with gold faces, pointed gold hats, gold arms & hands, and gold legs & feet. Naturally, Gnome Papa and Gnome Mama are the tallest figurines, measuring in at 3.5″ tall. All the Trimlite Gnome children: dancing daughter, laughing sister, brother playing horn, and laughing brother are smaller, at a height of 2.5″. What does surprise me are the introduction years of the members in the Gnome Family. All the gnome children were introduced BEFORE the gnome parents. The gnome children were introduced in 1983 at a retail price of $25 each. All gnome children figurines retired in 1988. The gnome parents were introduced in 1985 at a retail price of $50 each. Both gnome parents figurines retired in 1988. The Trimlite Gnome Family figurines are not the easiest figurines to find. 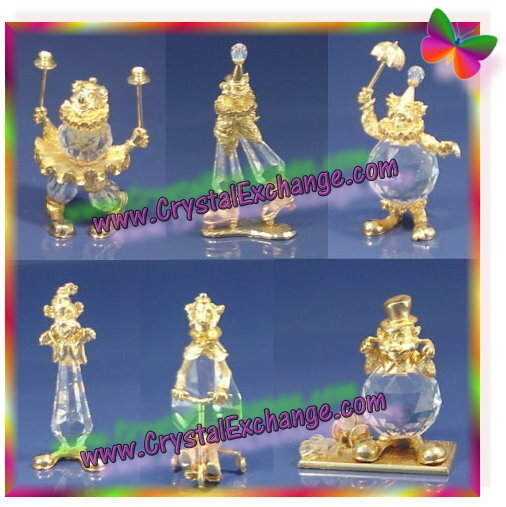 Crystal Exchange America has sold only 15 Gnome figurines in the 15 years they have been online selling retired Swarovski crystal. The last ones sold early in 2009, just over $200 each. Trimlite Clowns by Swarovski – Thank you for the Smiles! I recently learned that the first week of August is celebrated as ‘National Clown Week’….an interesting piece of trivia that I was unaware of. Clowns come in all shapes and sizes. Many clowns wear happy faces. Some clowns have special talents. Some clowns juggle. Some clowns do magic. Often, clowns can be found in a circus, at a theme park, in children’s hospitals, and in parades. If you see a clown, smile and let them know they’ve made you happy. The famous crystal brand produced Swarovski Trimlite clowns in the 1980’s decade. All the Trimlite clowns were introduced in 1983 and retired in 1988. These Swarovski clowns were all a part of the “Circus Clowns and Marching Band” group. All the Swarovski Trimlite clowns incorporate the typical clown characteristics. They have silly clown hats. They have oversized clown feet. Some are performing their ‘special clown talent’. And best of all, the clowns are all doing something to make people smile. The Swarovski logo that would be found on these crystal figurines is the Trimlite “T”. 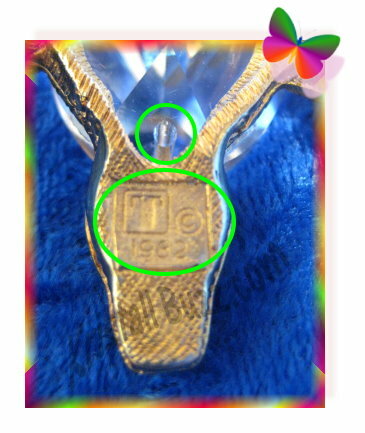 The Trimlite logo is stamped in the metal of the figurine. The Swarovski boxes for these figurines were white boxes with gold-colored plastic ribbons. Certificates are not applicable to these figurines as there is no such paperwork as a ‘Trimlite certificate’. These Swarovski clown figurines retailed for $30 or $50 each in the 80’s when they were available in retail stores. Now, on the Swarovski secondary market or on online auctions, the clowns are likely to cost $200 to $300 each for ones in excellent condition with original packaging. It is worthwhile to mention that the production quality of crystal figurines has vastly changed in the past 30 years. It is not unusual to see rough edges or other imperfections on the older crystal because that was likely acceptable standards at the time. Many serious crystal collectors will not accept chipped crystal figurines, but should be mindful that one considered ‘mint’ at that time will not likely as pristine as figures that are presently produced and sold. Now, due to the age of the Trimlite figurines, the gold has possibly dulled, tarnished, or even chipped off. Collectors should keep these things in mind when setting their own personal standards of acceptability into their own collection; do not require standards higher than what Swarovski themselves expected in the 1980’s. 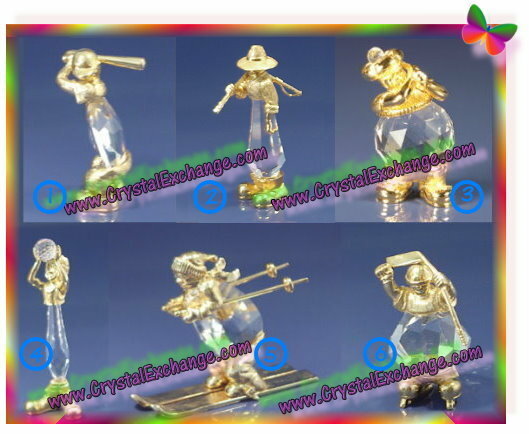 Crystal Exchange America presently has 3 of the 6 Trimlite Clown figurines offered on their site, ranging in price $215 – $350. They can be found in “Vintage Swarovski” category, “Trimlite and Zales” sub-category of the store. This weekend, there was a Hot Air Balloon event (Ohio Challenge) here in my local community. Hot air balloons are beautiful, elegant, peaceful.. For the balloon pilots, this is an event, a challenge, a competition. Regardless of your roll, I think hot air balloons bring on excitement for people of all ages. 72403 – Trimlite Hot Air Balloon with gold colored accents and Crystal Cal balloon. 72404 – Trimlite Hot Air Balloon with gold colored accents and Vitrail Medium balloon. 72405 – Trimlite Hot Air Balloon with silver colored accents and Crystal Cal balloon. 72406 – Trimlite Hot Air Balloon with silver colored accents and Vitrail Medium balloon. All eight Swarovski Trimlite Hot Air Balloons were introduced in 1982 and retired in 1986. The Trimlite Balloon figurines were part of the “Boutiques” group. The 3″ hot air balloons retailed for $50 USD. The 3.5″ hot air balloons retailed for $80 USD each. The Swarovski logo on these crystal figurines was NOT the traditional Block SC or Swan logo. This is because they were not in the Silver Crystal product line….they were in the Trimlite product line. The Trimlite logo is the letter “T”, and is likely stamped into the metal of the Swarovski figurine, not on the crystal as is usually done now. It is very possible that a logo may not be found on the Trimlite balloon at all. Use care when purchasing crystal hot air balloons and check with reputable sources, like Crystal Exchange America or Warner’s Blue Ribbon Books on Swarovski, to ensure your are getting an authentic product if that is a major concern of the purchase. Crystal Exchange America presently has 4 of the 8 Trimlite Hot Air Balloon figurines offered on their site, ranging in price $280 – $300. They can be found in “Vintage Swarovski” category, “Trimlite and Zales” sub-category of the store.